Remote Light - This light can be mounted anywhere on the ceiling in the garage. Power Lock - A deadbolt lock is activated by the opener each time the door is opened or closed. Cable Tension Monitor - Uniquely designed to monitor cable tension and help eliminate cable slips off the drum. Adaptive Force Setting - Senses changes to the door and will automatically adjust the force to temperature fluctuations, floor height & door track movement. Patented Absolute Positioning Technology - This new design will allow electronic limits to be extremely accurate even after a power outage or where power is removed for an extended period of time, such as in new construction. Powerful 24v DC Motor - Provides ultra-quiet slow start/slow stop for smooth operation. 1 - MyQ® Control Panel 888LM. 1 - 3-button 893MAX remote control. 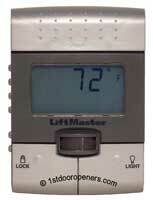 New Wireless Control Panel - model 885LM great for when a second control panel is needed. Additional remote lights- model 380LM (available below) available for when more light is needed in the garage. Additional Remote Controls- model 895MAX, 893MAX, 890MAX. Compatible Keyless Entry - model 877MAX. 6-foot power cord making connecting to a power source easier. Quick-connect terminals are push-in wiring for quicker installation. The Smart Garage Door Opener® - Lets you program additional remotes or a keyless entry from the motion-detecting control panel or the power head. 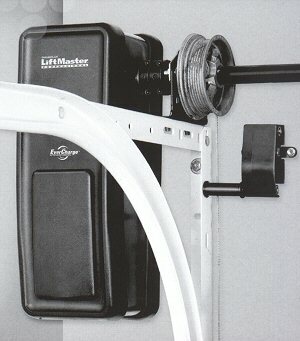 Wall mount Installation - Mounts on the left or right side of the garage door. NO rails to hang. Simply mounts on the wall and attaches to the garage door torsion bar. Must be within 6' of electrical outlet. Power Lock - Similar to a deadbolt, it ensures a door cannot be forced open once it goes down. Manual release handle in case of power failure to release door for manual operation. The Protector System projects an invisible light beam across the garage opening. If beam is broken while door is closing, the opener will reverse. Door will not close if beam is obstructed. HomeLink® compatible, the in-vehicle universal remote control. 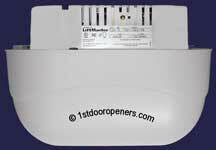 Garage Door Opener Dimensions: 6.85"D x 16.25'H x 6.01"W.
Maximum Door Size: Up to 14' High, Total of 180 square feet. Maximum Door Weight: 650 lbs. Travel Rate: Approximately 7.6" /Second. Headroom Clearance Required: 3" from Center of Torsion Bar. For use with model 3800 and 8500 Jackshaft residential opener. Remote Light works just like a traditional garage door opener light. Can be positioned anywhere on the garage ceiling within 6' of an electrical outlet. For use with LiftMaster 3800 and 8500 Jackshaft Garage Door Opener ONLY. Wireless wall control compatible with all 315 MHz garage door openers. Specifically designed for customers who want an extra control panel in the garage. Can be installed anywhere in the garage. Auxiliary button can be programmed to open and close a second 315 MHz garage door opener. This will NOT work with 390 MHz garage door openers. Remotes cannot be programmed from this unit. Garage door cannot be opened if battery dies. Light button must be programmed by a wired multi-function wall control panel. There is no lock feature to lock out remote controls. No constant LED - cannot be seen in the dark. There is no constant pressure to override the safety sensor in an emergency. 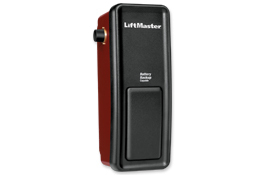 For use with the LiftMaster 3800, 8500 Jackshaft Garage Door Opener and Estate Series Models 2500, 2500B, 2500D & 3500 ONLY. Doors that use a torsion bar, springs, and a door no more than 14’ (4.2 m) high. 4”–6” (10 cm – 15 cm) drums, not to be used on tapered drums over 6” (15cm). High lift and standard lift sectional doors up to 14’ (4.2 cm) high. Review or inspect proposed installation area. Opener can be installed on left or right side of door. Select the side that meets the requirements listed below. Must have minimum of 2 – ½” (6.4 cm) between the garage wall and the center of the torsion bar. Must have minimum of 3” (7/6 cm) between the ceiling and the center of torsion bar. Must have minimum of 8” (20.3 cm) between the side garage wall (or obstruction) and the end of torsion bar. The torsion bar must extend at least 1” to 5” (2.5 cm to 12 cm) past the bearing plate. An electric outlet is required within 6” (1.8 m) of the installation area. If outlet does not exist, contact an qualified electrician. Depending upon garage construction, extension brackets or wood blocks may be needed to install safety reversing sensors. Alternate floor mounting of the safety reversing sensors will require hardware not provided. 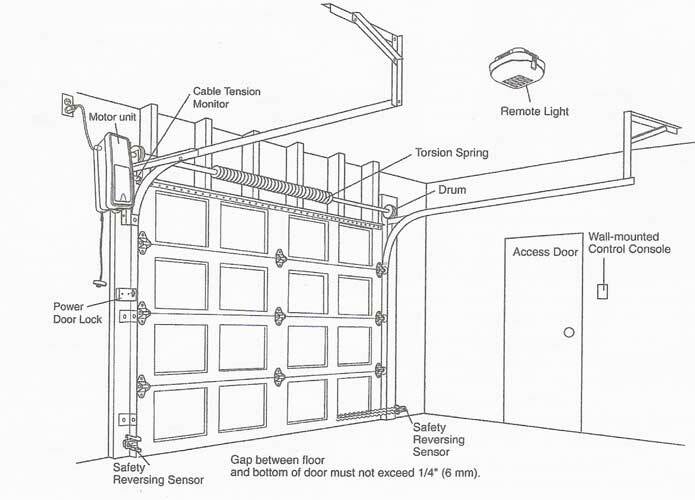 A model 475LM EverCharge Battery Backup System is strongly recommended if there is no access door to the garage, as this opener cannot be used in conjunction with an external emergency release mechanism. Any gap between the floor and the bottom of the door must not exceed ¼” (6mm). Otherwise the safety reversal system may not work properly.